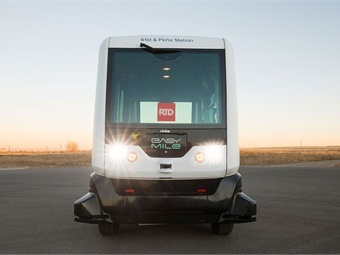 Denver's Regional Transportation District launched the first on-road deployment of an autonomous vehicle (AV) shuttle in both Denver and the State of Colorado. The EasyMile shuttle will be programmed to make designated stops along predetermined routes. It runs an average speed of 12 to 15 miles per hour and can carry up to 12 passengers. 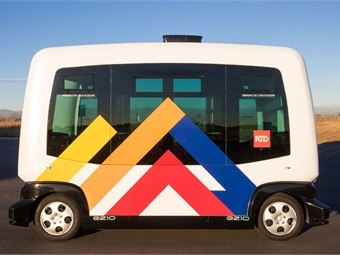 This autonomous vehicle demonstration project is approved by the National Highway Traffic Safety Administration and the newly-formed Colorado Autonomous Vehicle Task Force for six months of operations. Data collected on usage and operability will be shared between project partners to improve future deployments and bring autonomous services into wider usage. The shuttles have air conditioning, automatic wheelchair ramps, passenger information systems, electric batteries, and onboard USB chargers. Passenger feedback on all of these deployments has been extremely positive.